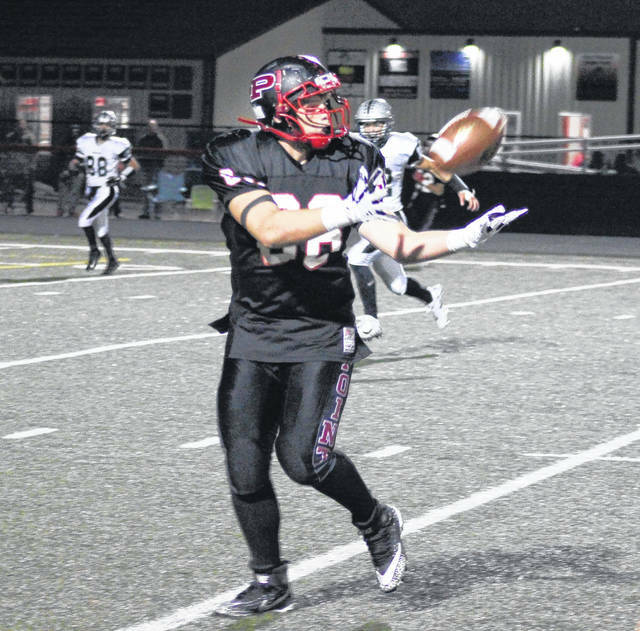 Point Pleasant junior Nick Parsons hauls in a pass during the second half of Point Pleasant’s 75-14 win over WestSide on Oct. 27, 2017, at OVB Track and Field in Point Pleasant, W.Va.
One team scored a lot of points in Week 2. Another is still looking for its first points through two weeks of play. Point Pleasant remained unbeaten with a 58-7 thumping of host South Harrison, while Wahama fell 40-0 at Miller in the Tri-Valley Conference Hocking Division opener for both programs. The Big Blacks improved to 2-0 for the sixth time in seven years under 11th-year head coach David Darst, who captured his 100th career victory with the outcome. Point Pleasant has outscored opponents 100-42 through eight quarters of play this fall. The White Falcons (0-2, 0-1 TVC Hocking) start the season winless through two weeks for a second year in a row. It also only the third time since the 2000 campaign that Wahama heads into Week 3 without a victory. The Green at Hannan contest did not have a final score yet reported as of deadline. Both Point Pleasant and Wahama are home in Week 3 contests against Warren and Southen, respectively. Hannan will travel to Manchester in Week 3 as well. All three Mason County programs will kickoff at 7:30 p.m. Friday night. Due to an early deadline, the Mason County football games from Week 2 will be available — if information is received — in the Tuesday sports edition of the Point Pleasant Register. Game stories will be available online at mydailyregister.com before appearing in print.